Oh my goodness. What a perfect way to make your home feel welcoming. Your family and friends will smell the goodness before their foot crosses the threshold. This dessert smells amazing. Pops and Chloe work late on Wednesdays and I wanted to make them extra glad to be home. They could not wait to get through dinner so they could find out what I had in the oven for them. Make sure tho serve this warm with your favorite vanilla ice cream. People will remember this cake for a long-long time. To make the caramel: In a 9 inch cast-iron skillet, melt a stick of butter on medium low heat. When it begins to bubble stir in the brown sugar. Continue stirring until smooth and bubbling, about 2 minutes. Remove from heat and stir in the cinnamon, nutmeg, cloves and vanilla. Allow to cool while you make the cake layer. Cream butter and brown sugar with your hand mixer until smooth and fluffy. Beat in the eggs one at a time. Add milk and mix until combined. Stir in, by hand, the cinnamon, flour and baking powder. Stir just until combined. Arrange the apples over the caramel mixture. Spoon the cake batter over the apples and bake for 45 minutes or until a toothpick inserted in the center of cake comes out clean. Allow to cool for 10 minutes before inverting onto a serving dish. Yep, I'll be trying this alright!! Two of my favorite things..caramel flavor and apples..cannot go wrong!! I can literally last it now.. it sounds and looks so yummy!! Aren't caramel apple desserts the best! MiMi made this and sent me the post and the pictures, but no cake. Can you even believe it?! I guess I'll have to make one for myself! I love it too! I definitely go through phases where I use them for everything and then get out the habit for a while. I am in a cast iron phase now ;-) Thanks, Sam! Just a little butter here! Sounds yummy! I can see the cast iron skillet full of apples now. Ha, you are right, but butter makes things better! Thanks, Linda! I love my cast iron skillets! This looks delicious. Definitely pinning for later. I love mine too, they are so versatile! Thank you! I live 100 km from a valley famous for great apples. I have marked this to try when the apples are ready there. Thanks for the post! How cool! I hope you love this when the time comes! Yes, please! 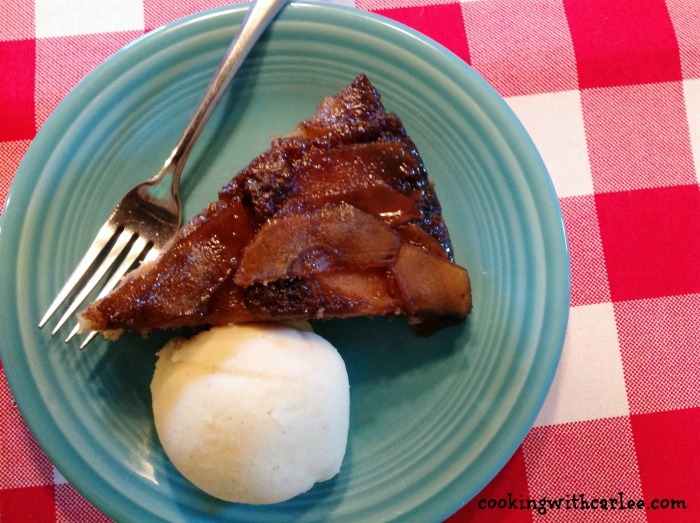 This an upside down cake that sounds right up my alley! Isn't it a fun one? Thanks and have a great weekend! This is one of those recipes that I couldn't pass by. I love things that are made in cast iron skillets. I really need to make this as soon as the weather cools off a bit. I love using my cast iron skillets for a little of everything too. I hope you love this! 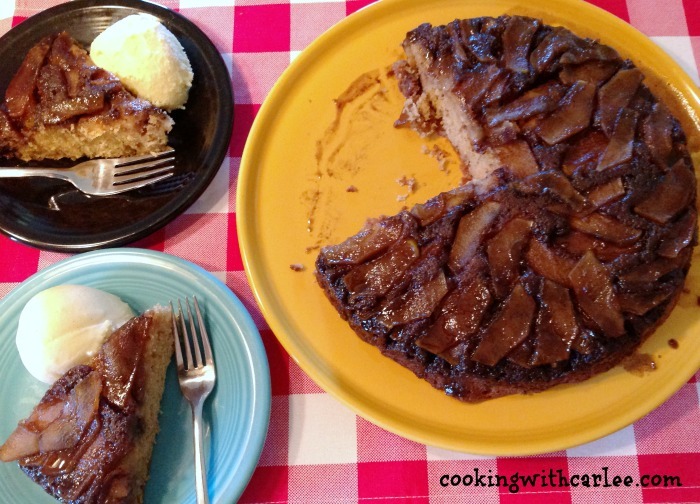 This Apple Skillet Cake looks amazing! I really appreciate you sharing with us at Full Plate Thursday and hope you have a great weekend! Isn't it a fun one? Thanks, Miz Helen! It is perfect with a nice scoop of ice cream! Thank you! Yum!! I have got to try this!! My family would love it. I hope you do, it is really good! Thanks! Carlee, this looks amazing! I can imagine the whole house smells like heaven. I love baked apples, but baked apples on top, or bottom, of a cake! Yummy! I bet they were really happy that they were home! Caramel and apples were just meant to be together, so this is a slam dunk in my book. Adding cake just takes it to the next level. Thanks as always, Nikki! Never tried an apple upside down cake, but it sounds amazing!! Thanks so much for linking up at You Link It, We Make It. Hope to see you back tomorrow to party! Any upside down cake is a good one in my book! Thanks for the fun party! Looks so tasty, Carlee--pinning this! Thanks for sharing at Funtastic Friday!